A statue at the Decordova Museum. I found this statue at the Decordova Museum both fascinating and haunting. As a friend pointed out, he looks a little bit like a mixture of a heavy metal fan and their fingers extended. 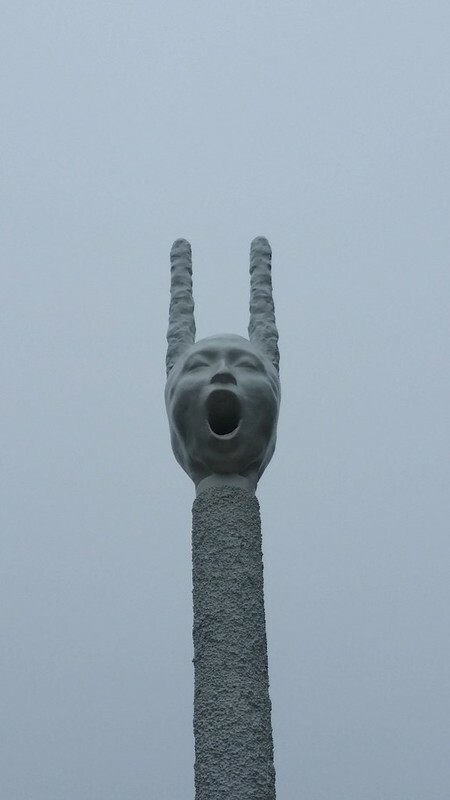 But This statue invokes in me something like a demon statute, something that borders the world and the world beyond the veil as the old horror writers used to say. I could even see it as a figure in Dante's Inferno, pinned to this strange artifice, trying to scream out for help but lacking any voice (since he doesn't really have a throat). But all that is to say, I find the image evokes more darker images than a heavy metal rocker.